When I heard there was a place called “the Silk Market” in Beijing, I imagined a series of narrow alleyways with merchandise stacked on tables, an overwhelming crowd, and people yelling at you from all directions trying to sell you things. In reality, the Silk Market is an enormous indoor mall. It’s very clean and organized and because I went on a Sunday afternoon, it wasn’t too busy. Many of my classmates went there on day trips to shop and pick up gifts to bring back to the U.S. and they told me to check it out. 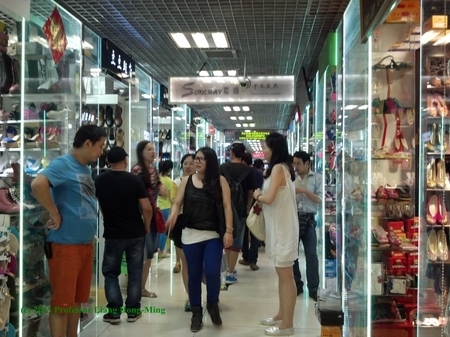 There are at least six floors in the mall and it is one of the biggest tourist attractions in Beijing for foreigners. The silk at the Silk Market is gorgeous and comes in many different varieties. Each floor is full of small shops and there was a whole floor dedicated to silk—scarves, ties, traditional outfits for men and women, and more. One friend knew a bit more about silk than I did; he asked the vendor to show us she was selling real silk. She pulled a lighter out of pocket, pulled a small thread from the corner of the scarf, and lit it. The thread burnt right away and left a blackish gray residue. My friend immediately smelled the dark residue and announced that it was indeed genuine silk. She explained that silk is a fiber, and when burned, will smell just like burning hair. Any girl who has ever curled or straightened her hair and held the iron in a little too long will be familiar with this smell. As long as the fabric has this smell, it is real silk. The Silk Market has much more than silk. There are bags and luggage, jewelry, shoes and clothes of any kind and style, watches, suits and tailor shops, calligraphy brushes and ink, fans and chopsticks. You can buy sunglasses and regular glasses; if you have your glasses with you, they scan them to find the prescription, and put the prescription in your new glasses in under an hour. The market has every sort of name-brand you can imagine. Gucci, Louis Vuitton, Rolex and other high-end brands are right next to brands you might recognize on a daily basis like Toms, Converse, and Nike. 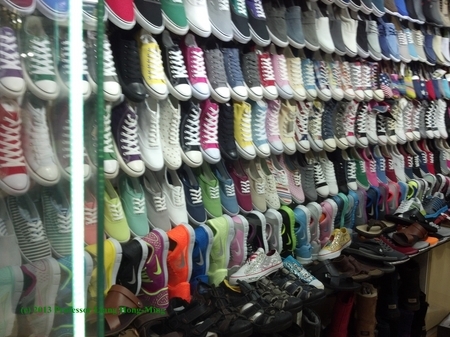 The thing is, almost all of them are fake. It is important to check the quality of each product here. I was looking at the jade necklaces and my friend picked up the jade, held it in her hand for a moment, then put it down and walked out of the store. She informed me that the jade was actually plastic—she could tell because of the weight. Jade, as a gem, would have been heavier. Out of curiosity, we took a look at the “Rolex” watches. For those that know Rolex watches, the second hand moves smoothly across the watches’ face, but these watches’ second hands ticked for every second. This is a minute detail, and I would never have noticed it myself not being at all familiar with Rolex watches. Other differences were more obvious—the buttons on the watch were plastic and didn’t function at all. Because the products are almost all knock-offs, the price is not set in stone. As the customer, you offer one price, they argue for a higher. It goes back and forth. Bargaining is a common thing in China, and my friend, who is Chinese, gave me some advice. If you feel the price is still too high, you can begin to walk away. If the salesman yells after you and stops you to offer a still lower price, you can get lower. If they don’t yell after you, then it means they wouldn’t have made any profit with that price. Bargaining can be frustrating, but it is worth the effort to get such low prices. Although I knew walking into the Silk Market that the brands were knock-offs, I still did not expect the prices to be so low. Cashier: 270 Yuan, 270 only. Friend: No no no, she is a student! A good student! Cashier: Fine, fine. 200 Yuan, 200. Friend: Too expensive, 75, 75. Friend: She is an especially good student, a fantastic student! The conversation went on like that while I stood there feeling simultaneously flattered and embarrassed. In the end, I got the shoes for 85 Yuan, just under $14. I never knew that silk smelt like burnt hair, or that it would be acceptable to ask the seller to prove that it was in fact silk. Another aspect of this article that caught my eye, was how the brand name plays an important role. They might have been fake, or knock off versions of high end merchandise, but those who buy it may feel as though they are closer to a higher class. I really liked the imagery you used, in some instances it reminded me of some of the markets in my home country. It’s always fascinating to read about the interactions between tourists and merchants throughout the world, even in these very short interactions you can get a glimpse of other cultures and their individuals. I have always been facinated with China and like hearing things about it so thats why I chose this article and I thought it was really good. I enjoyed learning about the Silk Market. One day if I ever get a chance to travel there I would love to visit the Silk Market. It reminds me exactly of how New York’s China Town was when I visited there. Also it reminds me exactly of Mexico. All of the bargaining, crowdedness, and cheap fake merchandise are just like those two places I visited. That is an interesting name to pick for a shopping mall. It is a good a way to draw attention to it though with people wondering if it is strictly for silk products. I like the part about bargaining because I saw the same thing happening when I visited a Mexican city and saw a lot of it. This was a really intriguing read; I especially enjoyed the tid bits of facts learned that I would have been completely oblivious to. I found bargaining to be an odd but interesting subject; I imagine that I would be standing on the sidelines watching as (hopefully) a friend would handle the situation. Thank you for sharing – a fun read! This was extremely interesting article. I would be horrible at the bartering thing! I felt like I could have been there with you the way you wrote the article. Thank you for giving us an insight into this great piece of hidden culture. I think it is funny to think about how one of the biggest tourist attractions in Beijing as well as in Minnesota happen to be malls and yet, the atmosphere seem to differ pretty greatly in both. I can never imagine trying to barter at register at a store in the US. I just accept the price for what it is and either buy the product or put it back down. Interesting to compare and contrast. I really liked how descriptive this article is, especially when talking about the jade and the Rolex watches. I wouldn’t have known this information about them being counterfeit either. What I also really like about this article is that not only does it show the relationship between the merchant and the buyer, it shows how globalization affects the consumer. Since China does not allow brands like Apple to have stores and products in their country, people are capitalizing on it by making counterfeits. It goes back to a topic I believe we talked about in Intro to Poli Sci. When there is struggle and strife, people profit. The people of China want luxury goods and struggle to get them, so merchants make fake goods and get a profit off of the people. I was fascinated to read about the experience with bargaining. I’ve never been to a place where bargaining is expected, and I would find it quite uncomfortable. It’s interesting that when bargaining the friend kept saying the author was a “good” student. It seems that a person is able to get a lower price if they have qualities that are considered admirable. It makes me wonder what other qualities people have that allow them to bargain for low prices, aside from experience. It’s interesting how bargaining is normal in China. Silk is a huge importance to China and has been for thousands of years. According to Tignor in Worlds Together Worlds Apart, “the Romans exchanged gold for Chinese silk,” (222). I wonder what type of silk products were on each floor. It would be very fascinating to see what they are worth.